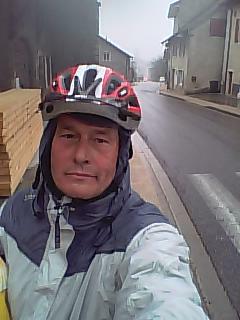 It has been WET today, heading up towards Geneva but falling well short. Major insight: rain and mountains slow you down. Duh!! I may not make it to Beijing after all before having to return to England in July, it seems. Lesson two of today is, if you intend to cycle a long way, don't scrimp and scrape on the cycling gear. So if you've bought the world's toughest and most expensive bicycle to cycle around Europe, don't make do with a Lidl cycling top. Challenged today for the first time seriously by rain, it leaked. Big Time. Requiring purchase, for a lot of money, of new and seriously waterproof jacket. See pic. Allowing therefore continued ride, but only for a total of 35 miles in all. Less than four hours in the saddle. But hey – this journey is about emotional distance, not physical. Though being a bloke, I do like to ratchet up the miles. Delightful, warm and dry accommodation last night with two painters, Marie-Eve and Jean-Paul Juen at their wood-panelled atelier in the mountains near Contrevoz. We all agreed that what ails France is an arrogance of the intellectuals, who won't countenance serious reform. Going back, perhaps, in Marie-Eve's view, to the French original sin of regicide at the time of the revolution? Interesting how deep history goes in a nation's psyche. Think Serbs and Russians as well as French or Germans. No postable picture of my hosts, but thanks anyway for taking me in so late last night, cold and hungry after a sharp dusk ride down the mountain. Today, emerging from their atelier, on the quietest of country roads, bumped into Karsten, amazingly the first seriously-laden fellow long-distance cyclist I've come across since arriving in France over two weeks ago now. 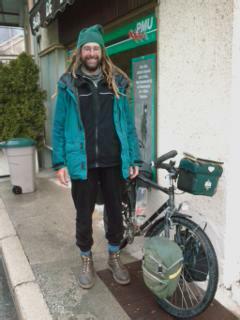 Dreadlocked and about 40, Karsten (in the picture above) comes from Erlangen in Germany (confirming my earlier French observer's comment up north that anyone with a heavily-loaded bike must be a Brit, or maybe a German), and is also seeking his purpose in life. During the summer, when not cycling around Europe, Karsten repairs bikes for students at the local university. And is desperate about climate change, having decided as early as the late 80s never to fly and not even to get a driving licence. It was good to meet a cyclist not togged up in Lycra and zipping arrogantly (again) past, like most French cyclists do, at a zillion km per hour. One of these blogs, I do want to muse about why one does trips like this. Whether one's a Karsten or a Mark. Are we nuts? Or seriously in tune with the Zeitgeist? (No prizes for guessing my view.) Answering the question so elegantly put by my 86-year-old Dad when I told him I was planning to cycle around Europe for several months, "What on earth do you want to do THAT for??"